Play as any character you want! Explore a 2-d mobile version of a real-life exciting destination! Learn about contemporary Inuit culture while having fun! Team up friends with Greenlandic Gods and Heroes to explore the world and save it! The “Kaverini” series is one of tourist-themed RPG’s with fantasy elements in cartoon versions of real-world places. In the not-too-distant future, we’ll see the first mobile entry in the series come to IOS and Android, “Kaverini: Nuuk Adventures”, in which you’ll be able to play as a tourist in a 16-bit 1990’s-inspired version of Nuuk, the capital of contemporary Greenland! The name “Hans Egede” may not mean much to you now, but he’ll be your best friend. Just wait! Oh, and he’s a bit overpowered. Just sayin’. Even the industrial sections of town come to life! So, once you land in Nuuk, you’ll be able to explore a version of the city almost identical to what it would be in real life, perhaps more inviting because you’ll hear characters tell jokes, have fun and inform you about local affairs and culture. You’ll be able to interact with the big tourist attractions and savor the great outdoors. In short, you’ll get to go on a virtual vacation! But unlike a vacation you’d normally take to Greenland, “Kaverini: Nuuk Adventures” takes it a step further, with elements of magic and bending time-space that make it feel more like an RPG. So what you’ll be able to do down the line is talk to the many historical figures throughout Greenland’s history, and in some cases, take them along with you as companions on your journey! 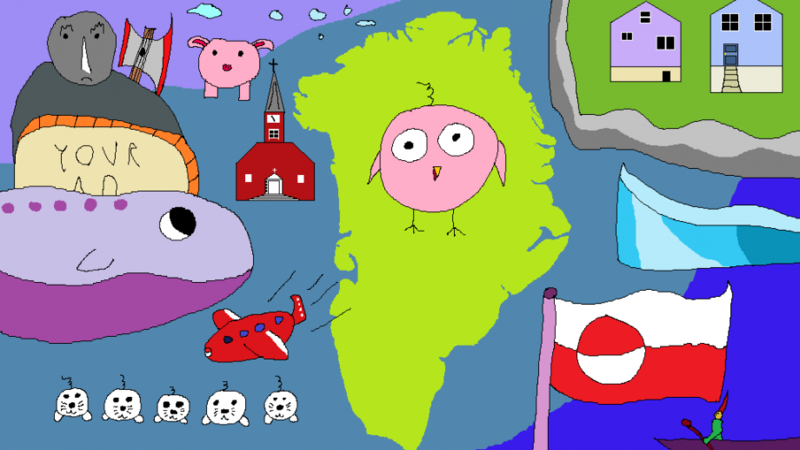 If you can recognize all of these characters except the bird and the pig, you’re either Greenlandic or have beat this game! What begins as an ordinary vacation with a luggage mix-up will bring you to a “one-thing-led-to-another” plot that will put your dream character in a role more heroic that you can fathom, even by video game standards! Even better, you’ll find this game to be a love letter to the cultures of Greenland, past, present and future, inspired by its heroes, saddened by its suffering, and hopeful for a world in which the “Land of People” shines even more brightly. Even BETTER, you won’t be using pointed sticks to beat bad guys, instead harnessing the power of your emotional intelligence, in thirteen distinct flavors, to convince bad guys to stop being so misguided and to see things your way. The more foes you convince, the higher your emotional intelligence becomes, and different emotions affect different foes in various ways! And to send you off, a soundtrack teaser written by Greenlandic composer Marc Fussing Rosbach, who is writing a lot of the Background Music…you’ll hear this song when you wake up in your hotel or tent and decide to explore the great wide world beyond it!